I was happy with the service I've experienced from Delta Airlines, so wanted to go with them again, but they only provided 1.5 hrs for my connection in New York. That's risky, given border queues can be long, so I was forced to go with American Airlines instead (though the international part of the flights was operated by British Airways, immediately making me feel more comfortable. Adding even further to that comfort, I thought I'd wear my spats on the flight too: the fabulous way to beat DVT! ;D). I could have plumped for US Airlines or United, but the level of vitriol directed online at those two, especially the former, put me off. Flights for 2014 were somewhere in between the endless connections of 2012 and the direct flights my gf and I did in 2013. I only had the one change on the way there, at New York. Personally I quite enjoy long haul flights, because it means I get to watch lots of films. I even relish airline food, but as anyone who knows me can attest, my tastebuds aren't exactly refined. It was a good thing I had made sure to leave at least two hours to connect. JFK did indeed have a wait at the border queue, though it didn't delay things as much as the horror stories I've read indicate. All in all it took 1 hour and 15 mins to get to my gate for the Virginia part of the journey. Once I was through border control, I needed to cross the street and grab the AirTrain to terminal 8 for my connection. It is relatively obvious where to go, but I wouldn't have known that I needed to head over there if somebody hadn't told me (but then my directional sense is seriously lacking). When I originally decided to add Virginia as a stop, it was because US Grappling co-founder Chrissy Linzy and prominent blogger BJJ Grrl (her real name is Leslie) lived there. Prior to my arrival, Chrissy introduced me to Adrienne, where I would be staying: she has a big house with a couple of guest bedrooms. 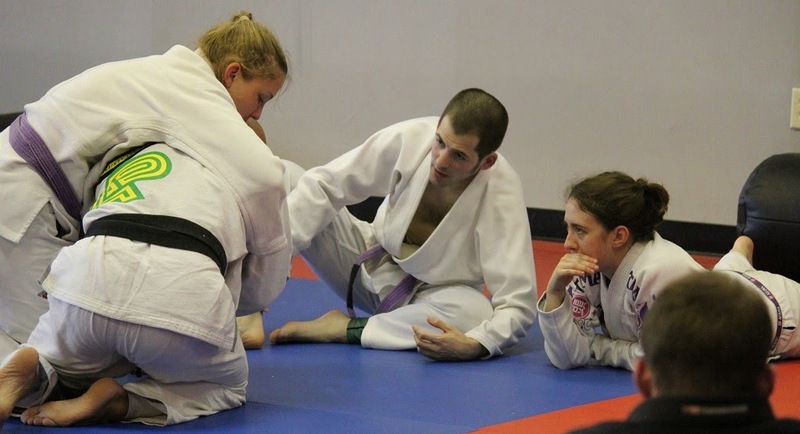 I was excited at the prospect of meeting her, as Adrienne runs a gi company, The Green Gi: a chance to look behind the scenes of the gi manufacturing, branding and selling process was appealing. The trip got even better when it turned out that not only would I get to meet Chrissy, Leslie and Adrienne, but several other BJJ visitors were coming along too. Well known black belt, BreakingMuscle.com author and Groundswell Grappling co-founder Val Worthington was on the list, along with the mightily bearded Mike Byrd (that's one word, in case you ever meet him) and of course Chrissy's husband and fellow US Grappling brain, Brian. The next day I had a fascinating chat with Adrienne and Leslie about the Green Gi. Having reviewed many a gi at this point, I'm interested in the whole process of bringing a gi to the market, something Adienne knows a great deal about. She showed Leslie and I different fabric samples, discussed stitching, weaves, suppliers, working with local businesses, how to correctly dye material and how minor changes can cause a significant shift in tone. We had numerous other chats on those kind of topics over the course of my stay, several of which I recorded. I'll be putting one of them up somewhere as an interview (either online or in a magazine if I can find an interested party), while the rest were all background research for the reviews I want to do of The Green Gi hemp belts and hemp gi. Adrienne's house is amazing. She not only has plenty of bedrooms, she has a large garden where she grows a range of vegetables, but best of all, it backs directly onto a river with access to a lake. There are a couple of ducks and Adrienne also has a lovely whippet called Hummer. I can't remember hearing him bark once: he's friendly, well behaved (as far as I could see) and has a great temperament. The whole gang got together a few times to eat, as well as play something called Cards Against Humanity. I haven't played it before, but my gf was familiar with it when I mentioned the game on Google Hangout, so it must have reached the UK too. It turned out that Adrienne's partner Antwain (who owns his own gym and was part of the TUF 8 cast) and Chrissy's husband Brian had both nailed this game, though Chrissy was right behind them. We gathered at Chrissy's house to watch the UFC, though I was feeling dozy and eventually fell asleep for part of it, so can't remember much of what happened. Even more exciting was the opportunity to interview Val before she left, which I followed up by interviewing almost everybody else in the group too. Leslie was the first of my 'blogger interviews': I'll be putting those up on slideyfoot.com in the 'BlogChat' series, as it seems the most appropriate place. Even more so than 2012, this was very much a jiu jitsu trip. I didn't do anything that wasn't directly jiu jitsu related, including some training at Antwain's beautiful gym (I rolled with almost everyone, before I tweaked my neck slightly by being stubborn in a triangle) and then a seminar with NHBGear legend Dave Jacobs. I also learned how to properly sew on gi patches, handily. In my previous attempts, I have tried to sew a corner in place, hoping that by sewing around the full edge, it would stretch out the patch enough to stop it becoming all crumpled. Watching Adrienne in action, I realised that a much better method is to put pins all around the patch's perimeter to stretch them out. A simple difference, but should mean my Meerkatsu patch fits properly when I sew it onto my hoody.